The Audience module is used to track video engagement data for videos that are viewed inside of an Audience-enabled Brightcove Player. Viewing data is stored in Video Cloud and can optionally be synchronized to popular marketing automation platforms such as Eloqua, Marketo, HubSpot and Salesforce. To access the Audience module, login to Video Cloud and click Audience in the navigation header. 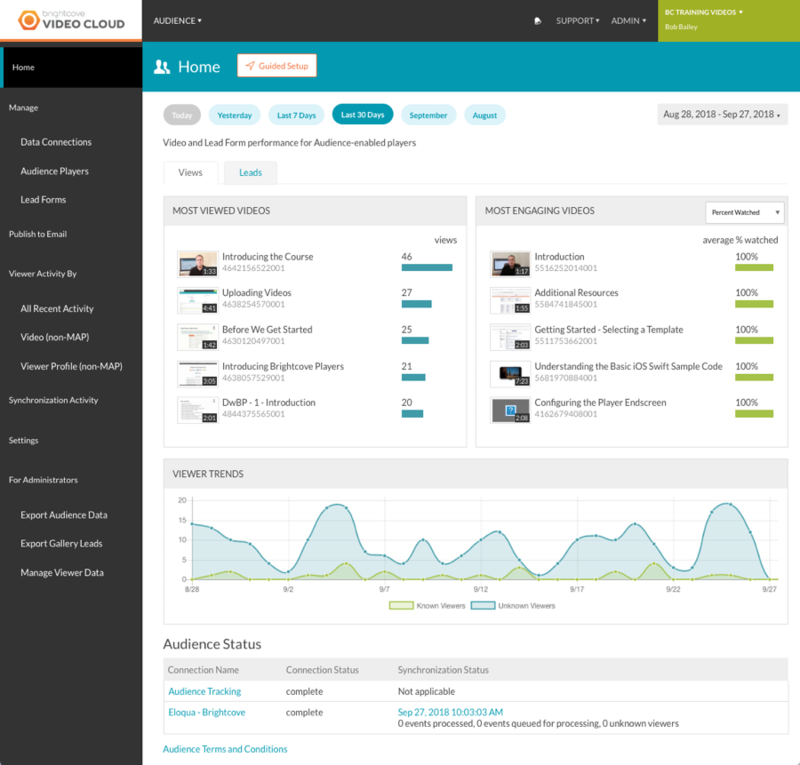 The Audience homepage displays video engagement data which provides insights into how long videos were watched, which videos were watched, and who watched them. This allows you to better engage and convert your audiences. The Most Viewed Videos chart displays the most viewed videos in Audience-enabled players for the selected time period. The Most Engaging Videos chart displays the most engaging videos in Audience-enabled players for the selected time period. Engagement is the average percent watched. For details on how we calculate video engagement, watch the training video Calculating Video Engagement. The Viewer Trends chart displays video views over time for the selected time period. Views from both known and anonymous viewers are displayed. Hovering over the graph will display the actual data points. Note: When using a Marketo Munchkin connection, the Viewer Trends graph will only show data for Unknown Viewers. When using a Munchkin connection, user details are not collected. For more detailed user information, the Marketo REST connection should be used. For information, see Integrating Video Cloud with Marketo Using the REST APIs. 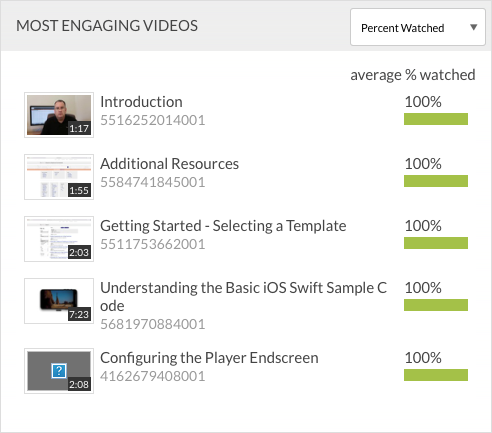 The Top Converting Videos chart displays the videos with the highest conversion rate. 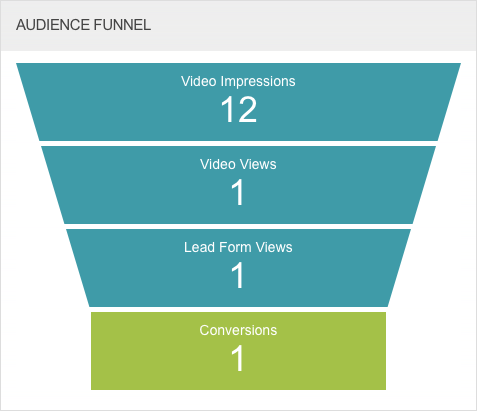 The conversion rate is calculated by dividing the number of submitted lead forms divided by video impressions. The Leads Chart displays the number of submitted lead forms by day for the selected time period. Hovering over the graph will display the actual data points. The Audience Status section displays the current status of the Audience module. The Data Connections option is where you configure the Audience integrations. Audience can integrate with popular marketing automation platforms ("MAP integration") or the viewing data can be saved locally and then exported or extracted using the Audience API ("non-MAP" integration). The following table outlines the supported integrations. When publishing Audience-enabled players, use the Advanced Embed (in-page) publishing code. The Standard Embed (iframe) publishing code will not work as the Audience plugin will be running inside of an iframe and therefore will be unable to access any parent page URL parameters and may not get the correct cookies. Note: The number of connections that can be configured is based upon your Video Cloud subscription. The Audience Players option allows you to create Audience-enabled Brightcove Players. Video engagement data will only be recorded when video content is viewed inside of an Audience-enabled video player. For information on creating Audience-enabled players, see Creating an Audience-enabled Player. The Lead Forms option allows you to create lead forms for data capture. Once a lead form is created, it can be associated with an Audience-enabled player. For information on creating lead forms, see Creating an Audience Lead Form. It is also possible to create and use lead forms that are created inside of a third-party marketing automation platform. The Publish to Email option allows you to select a player, video and then generate the HTML embed code to email the video. For information, see Publishing a Video to Email using the Audience Module. Note: The Media module also provides the ability to publish a video to email. For information, see Publishing a Video to Email. The All Recent Activity option allows you to view the player view events that were recorded for the past 24 hours. For information, see Viewing Player Events in the Audience Module. The Video (non-MAP) option allows you to view the viewing activity for a video. For information, see Viewing Video Activity. The Viewer Profile (non-MAP) option allows you to view the player view events by viewer. This option is enabled when using SSO or custom integrations, or Audience Tracking. For information, see Viewing Viewer Profile Information. 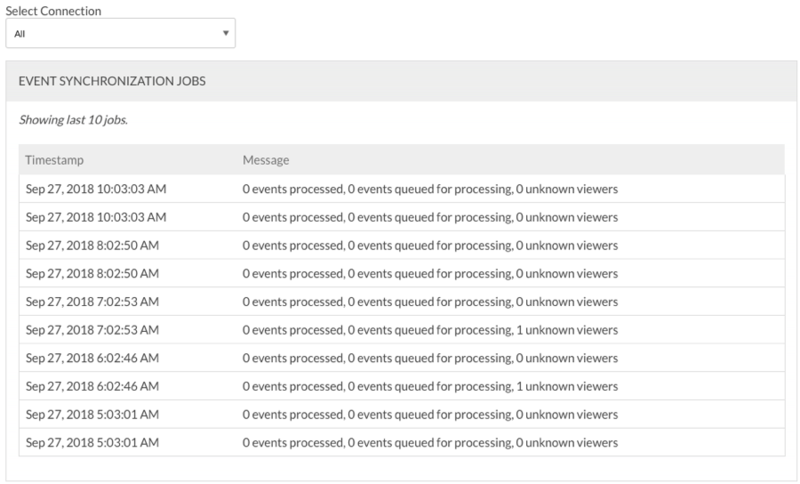 The Synchronization Activity option displays the last 10 jobs that were synchronized from Audience to a marketing automation platform. Synchronization runs on an hourly basis. Select a connection and then click the Test Sync button to run a synchronization. This is helpful when testing new integrations to avoid having to wait to see if event data is being sent to your marketing automation platform. Test Sync can be executed once every 5 minutes up to 10 times per hour. Note: When using custom integrations, no synchronization jobs are created. Synchronization jobs are created only when using integrations with a marketing automation platform. The Settings option allows you to configure some default settings for the account. For information, see Configuring Audience Settings. The Export Audience Data option is used to export view event and lead form data. This option will only appear for account administrators. For information on exporting Audience data, see Exporting Audience Data from the Audience Module. The Export Gallery Leads option is used to export lead form data that was captured from Gallery experiences. This option will only appear for account administrators. For information on exporting Gallery lead data, see Exporting Gallery Lead Data. The Manage Viewer Data option allows you to search for a user and then either remove that user or export that user's data. This option will only appear for account administrators. For information on managing viewer data, see Managing Viewer Data.